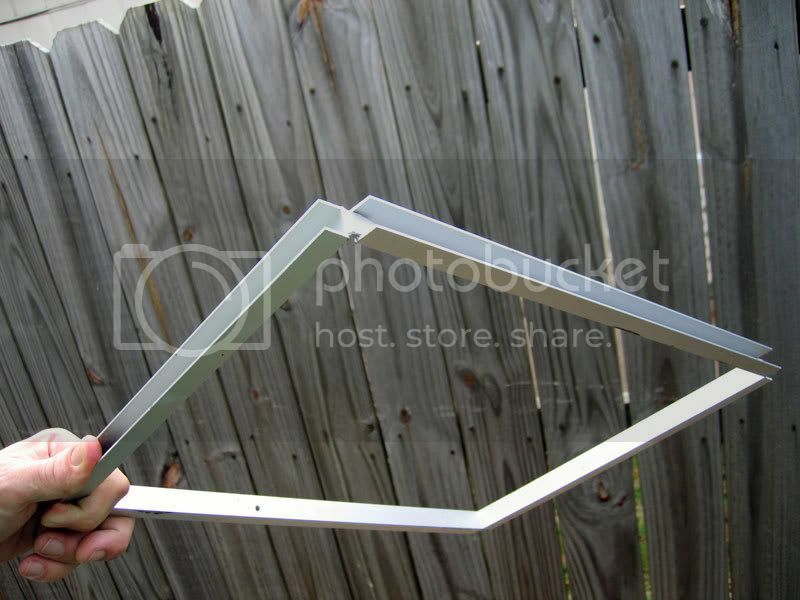 In the kitchen vacuum forming Instructable I describe how to make aluminum plastic clamping frames from window screen frame material. Those frames are nice because they're easy to make, and you can mix and match side lengths to get various sizes and aspect ratios for different projects. 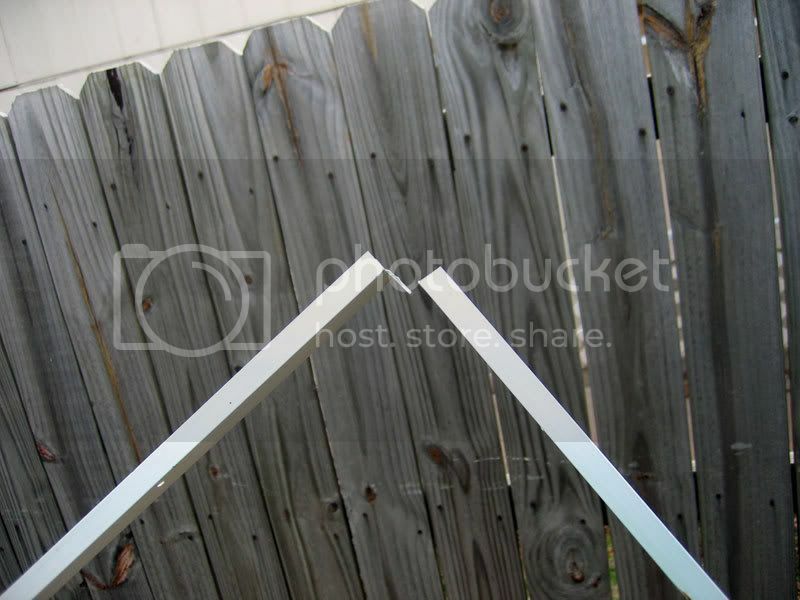 Aluminum window screen frame material is a bit flimsy, however, so if you're making big stuff or using really thick plastic, you may want something more rigid. Aluminum C-channel is a good choice, too. You can find it in several sizes and a couple of thicknesses at a home improvement store like Home Depot or Lowe's. This is a small (12 x 18") frame made of small C-channel (3/8", 1/16" or 1/20" thick), but the same technique works for larger frames made of correspondingly larger and thicker C-channel. Where the C-channel comes back and meets itself, there's a little extra piece with the horizontals cut off, to make a tab. Rigidity of a solid is generally proportional to the cube of the thickness, so one frame twice as thick is 8 times as rigid. 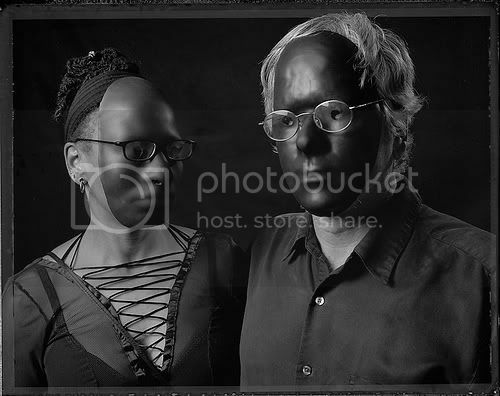 (Or 4 times as rigid as two frames.) 3/8" thick C-channel is considerably more rigid than window screen frame stuff, and 3/4" C-channel is way, way more rigid. You only need one frame that's pretty rigid. The other one only needs to be rigid enough to spread a fair bit of the clamping force halfway from one clamp to the next. To maximize rigidity for a given cost, you should generally combine one thick, rigid frame with a thinner, more flexible one. So, for example, you might make one frame out of 3/4" C-channel 1/8" thick, for overall rigidity, and another out of 1/4" C-channel 1/16" thick. That will be stiffer than a pair of frames made out of 1/2" C-channel. Making the top and bottom frames different also gives you some interesting choices. You can have one frame that's rigid along the sides, and another that's fairly flexible along the sides but has rigid corners. Once you clamp them together, they'll be fairly rigid all around. One version of that would be to make a main frame out of 3/4" or 1" C-channel, with the horizontal parts cut to let you bend the vertical parts. That gives you rigid bars but not very rigid corners. You can combine that with a matching frame made out of aluminum windowscreen stuff, which is flimsy (and inexpensive) but has rigid right-angle corners. Between the two of them, you get rigid bars and fairly rigid corners, with no welding or brazing. The same scheme would work with a much larger frame made of, say, 3/4" C-channel made of 1/8" aluminum. The other frame could still be made of window screen frame stuff; as long as you have clamps every few inches, it's rigid enough to hold the plastic against the more rigid frame. The gotcha with mixing C-channel frames and window screen frames is that the positioning of the clamps (binder clips) can interfere with the gasket seal. With two C-channel frames, the clamps can go inside the C's of both frames, and the bottom of the bottom frame is left flat to seal against the gasket. 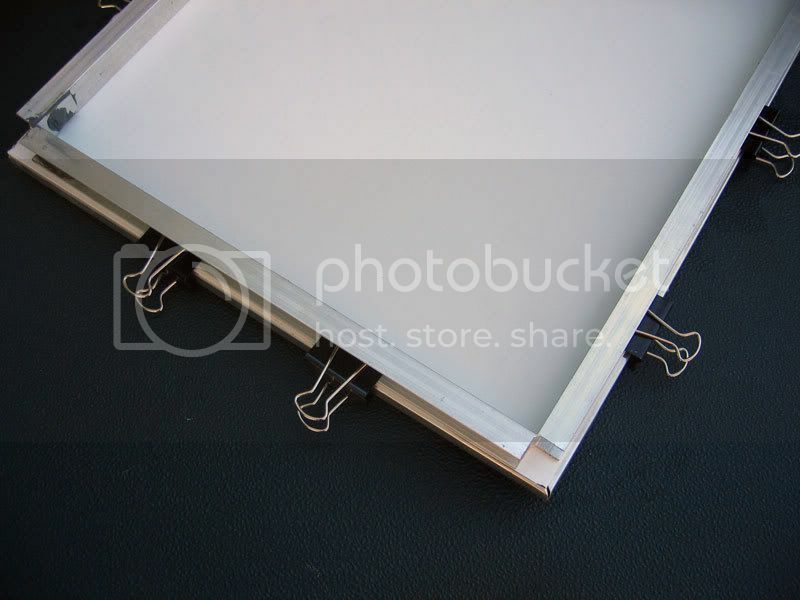 With two windowscreen frames, you can just put the binder clip around both frames, with the rolled edge extending inward past the frames to clear the gasket and leave the bottom flat where it meets the gasket. But with one frame of each type, you can't really do either---if one edge your clip goes inside the C channel, that stops it from moving inward further than the frame, and the rolled edge on the other side is stuck against the window screen frame where it meets the gasket. Oops. So if you mix the two, the C-channel frame has to go on bottom, because the binder clip can go inside it and not mess up the seal. That may not be what you want, if you're using C-channel to make a thick, rigid frame. (Generally you'd like the thinner frame on bottom, so that it doesn't raise the edges of the plastic way above the platen.) In that case, you may be better off with two C-channel frames, with big C-channel for the top frame, and small for the bottom one. To get good corner rigidity using only C-channel, you can attach flat L-shaped angle braces to the top horizontal parts of the top frame. (That's one advantage of C-channel over L-profile aluminum---the upper surface of the top frame can have something riveted or bolted to it without interfering with the surface that meets the plastic.) A couple of L-braces on diagonally opposed corners makes the frame almost as rigid as braces on all four corners. 1. Use a hacksaw, and a miter box if you have one, to get the two slits aligned at each bend. Disaligned slits may make it prone to bending out of a plane and making a warped frame. 2. Be careful not to score the vertical part when you cut the horizontal parts. 3. For drilling, start by making a pilot dent with a punch or a hammer and a nail, then drill a small pilot hole, then the 1/4" hole. Don't try to drill a 1/4" hole without a pilot hole. Hmmm... it seems that C-channel frames are also in Doug's book. Yet another Walsh wheel I've reinvented. 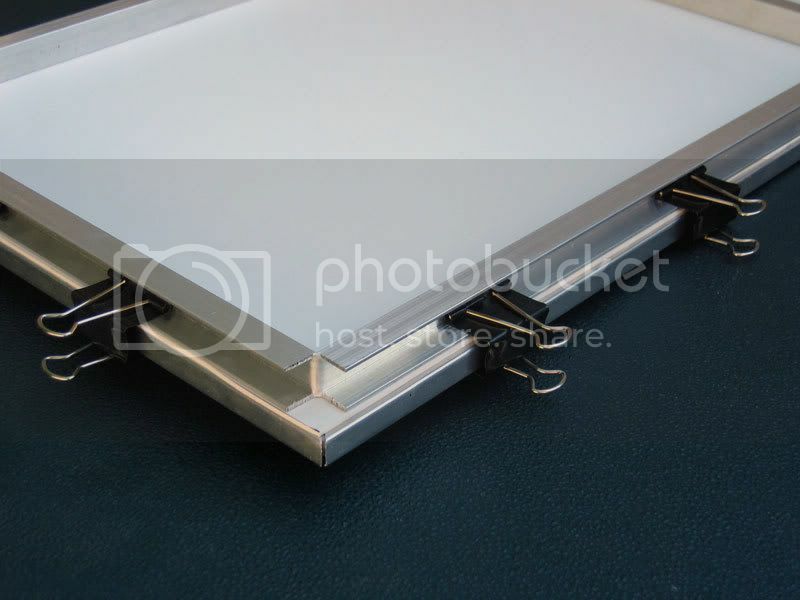 I've also come across a commercial vacuum former using this kind of frame, with L-shaped braces riveted to cut-and-bent C-channel to make the corners rigid. My name is Pratik; I'm a Web Associate for ThomasNet.com. I came across your site and I notice you make mention of CNC Related articles. ThomasNet recently launched a large information base at http://www.thomasnet.com/articles, and we have a specific article(s) that I thought you could make use of. If you have a moment, could you please review the article and see if it's worthy of a mention on your site as an additional resource for your users? Your blog is great---We are in Nicaragua and would like to do this for a DIY lab space we are building for medical professionals. However, we only have access to a handheld dust-buster size vacuum in Nicaragua. Will this work? To the poster above - yes, a dustbuster type vacuum should give enough draw, but would depend on how deep the part you're forming is. I get good information about how to make aluminum plastic clamping frames from window screen.This one use for the kitchen vacuum forming. It really very easy to make.